Premium Selections available on weekends and holiday Mondays only. 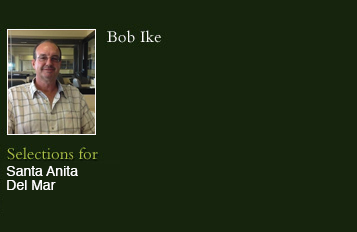 Enter your email address below to receive Bob's Free Pick of the Day. PLEASE NOTE: By entering email address for Free Pick, you agree to receive weekly updates and promotional information from BobIkePicks.com. years, where he has been the leading public handicapper at countless meetings. Ike also co-hosts the Thoroughbred Los Angeles radio show (Saturdays at 9:00 a.m. on KLAA 830 AM) and serves as a handicapping host for the Del Mar satellite television show. Click the MEMBERSHIP tab for pricing information.